Nancy (?) married Daniel Houghton. Marriage 2nd w ?? ; alt. name of Mary E.? Ira Houghton married Almira Winslow in Oct 29, 1854 at Ionia Co., MI, USA. Ira Houghton married Mary E. Rhodes. Ira Houghton married Matilda (?) 2nd w ?? ; alt. name of Mary E.? Charles Leonard Houghton married Cordelia (?) in circa 1858 mar 30 years in 1900 census; mar 52 y in 1910 census. Laura Houghton married Randall Stivers Compton at Ionia Co., MI, USA. Lydia Houghton married Simeon Peter Knapp in Dec 25, 1857 at Ionia Co., MI, USA, with Asa and Ira Houghton as witnesses. 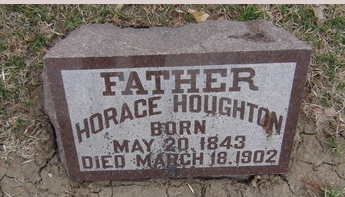 Horace Houghton married Margaret E. Foreman in circa 1865 mar 35 years in 1900 census. Lyman Houghton married Martha May Bennett in 1872 at Ionia Co., MI, USA. Addison Houghton married Eliza Ann Smith in May 5, 1872 at Orleans, Ionia Co., MI, USA. Addison Houghton married Emma Louise Piper in Feb 24, 1887 also given as Emma L. Piper. Sarah Jane Wall married Ervin Orlando Houghton, son of Alvin Houghton and Betsey Hilton, in Sep 13, 1866 at Sangamon Co., IL, USA, Lic 2131. Laura Ethel Houghton may have married Erik Emmanuel Bureman. 1940 Census 1940 Bishop, Inyo Co., CA, USA, age 56, divorced, bus driver, passenger transportation co.
Herbert Houghton married Laura M. Quinn in circa 1913 age 26 and 18. Herbert Houghton and Laura M. Quinn were divorced. Erik Emmanuel Bureman may have married Laura Ethel Houghton, daughter of Ervin Orlando Houghton and Sarah Clara (?). Zilpah Whitney and Tilley Moore declared their intentions of marriage on May 15, 1762 Lancaster, Worcester Co., MA, USA. Zilpah Whitney married Tilley Moore, son of Deacon Joseph Moore and Rebekah Houghton, in Aug 26, 1762 at Lancaster, Worcester Co., MA, USA. Solomon Stewart married Elizabeth Moore, daughter of Deacon Joseph Moore and Rebekah Houghton, in Apr 10, 1769 at Lancaster, Worcester Co., MA, USA. Ethan Kendall married Thankful Moor, daughter of Deacon Oliver Moor and Abigail Houghton, in Jul 4, 1771. Alida Helen Louise Gutow married Emmett Houghten, son of George Houghten and Augusta Hoffman, in Sep 6, 1916 at Detroit, MI, USA. Richard George Schulkins married Marjorie Virginia Houghten, daughter of Emmett Houghten and Alida Helen Louise Gutow, in Oct 23, 1948 at MI, USA. Eugene Wiley Miner married Marjorie Virginia Houghten, daughter of Emmett Houghten and Alida Helen Louise Gutow, in May 2, 1970 at MI, USA. Augusta Hoffman married George Houghten, son of William Giles Houghten and Sarah S. Sullivan, in May 31, 1887 age 19 and 18. Jennie J. Nowland married Albert Stanley Houghton, son of George O. Anderson and Bernice H. Robinston, in 1933 at MI, USA. Kathryn Rees Stuart married Kenneth Lance Houghton, son of Lester Orville Houghton and Gladys Marie Williams, in 1968 at MI, USA.